Summary: A new groom scores the ultimate Penguins fan's wedding reception. 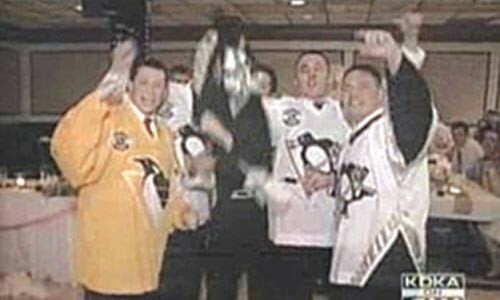 Reporter: Paul Martino, KDKA on CW Airtime: 2 minutes, 23 seconds on May 17 Visuals: * Scenes from the wedding, which feature groomsmen in their Pittsburgh Penguins jerseys, shooting "pretend" pucks. * Martino chanting, "LET'S GO PENS!" with the groomsmen. Highlights: * When anchor Stephanie Watson previews, "And saying the fans are really getting into the playoffs is an understatement." 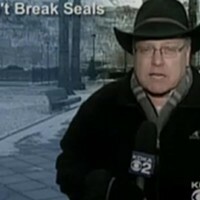 * When Martino observes, "I don't have to tell ya that Penguins fever is all over town tonight. Example, here at Mellon Arena right now where there's a Lynyrd Skynyrd [concert] underway -- every once in a while we can hear the audience screaming inside the arena, 'Let's go Pens! Let's go Pens!' But that's nothing compared to the wedding reception I went to in the North Hills tonight." * When Martino reports, "At moments, it was hard to tell if this was a wedding reception or pre-game rally." * When Martino adds, "But there was no mistaking a wedding when you saw the beautiful bride. ... It was the groom, of course ... who decided to give his wedding reception a Penguins theme." * When Martino asks him, "This is the one of the biggest days of your life: You're thinking about the hockey game?" And the groom explains the small change in plans: "Authentic touch to the wedding. Authentic touch to the wedding. ... Let's go Pens, baby." * When Martino divulges, "There were delicate negotiations, but the bride gave in to her new husband's plans." * When the bride says, "Yeah, it was all right with me. He's an awesome guy. He can do what he wants, I guess." * When Martino asks the groom about post-wedding plans and he replies, "We're goin' to Aruba on Monday, we're watchin' the Pens game tomorrow." * When Martino wraps, "So let me be the first to introduce to you the bride and groom ... and I wish the bride and groom all the happiness in the world. I just hope the Penguins win tomorrow afternoon so they don't have to go back to Philadelphia for game number six, because I'm afraid [the groom] might just cancel his trip to Aruba if that happens." What We Learned: This is what's called putting a net worth on your marriage. Unanswered Question: Why marry an ice queen when you can marry a cool princess like this bride? News Value: 4. Puts a new twist on the "penguin suit" that men have to don for formal events, doesn't it? The story's cute, it's current, and, oh -- LET'S GO PENS!